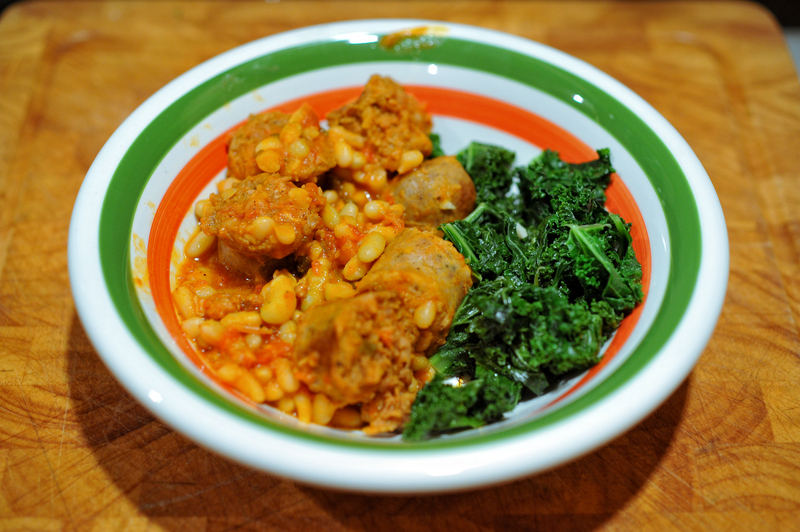 Fresh sausage cooked and served in saucy white beans, in my memory, is something common in Italy. Instinct told me that it was exactly what a cold January night called for, and so I armed myself with some links and dried beans from Rosemont Market. While it doesn’t take a genius to ad-lib a dish of sausage and beans, I wanted to work from the authentic recipe. But when I turned to my most trusted Italian cookbooks, I was peeved to find that not one offered a recipe that came even remotely close to it. I almost began to doubt myself, thinking that perhaps the dish is not as prolific as I remembered. Maybe it was simply a specialty at the Florentine restaurant, where I clearly remember fighting Justin for the last forkful of fagioli cloaked in a naughty robe of sausage-juice infused tomato. Il Cantinone del Gallo Nero, as it turned out had my answer on their webpage: fagioli all’uccelletto con salsicce was what I was after. As with all Italian cooking, the success of this dish depends largely on the quality of your ingredients, and a cornerstone to this one is using dried, rather than canned, beans. A firm bean is half the point of this dish – it’s the canvas onto which the salty, smoky satisfaction will be added. Since canned beans are about one minute away from pasty mush (just consider the gummy goo at the bottom of the can if you need any further convincing), dried beans are essential since this dish depends on a process of cooking down to bring the flavors and textures rightfully together. 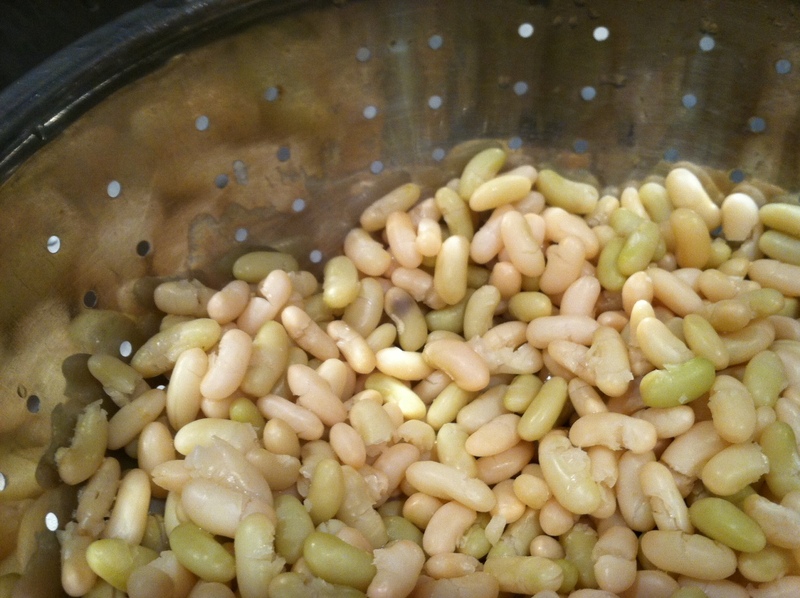 I soaked about a pound of flageolet beans overnight (any kind of medium-sized white bean will do). Note that if you aren’t able to soak the beans overnight, usually an hour of soaking and a longer boil time will make up the difference. When you are ready to start cooking, boil the soaked beans with a little salt until they are tender, but still underdone, somewhere in the ballpark of 30 minutes. Before straining, you will want to reserve one cup of this water. 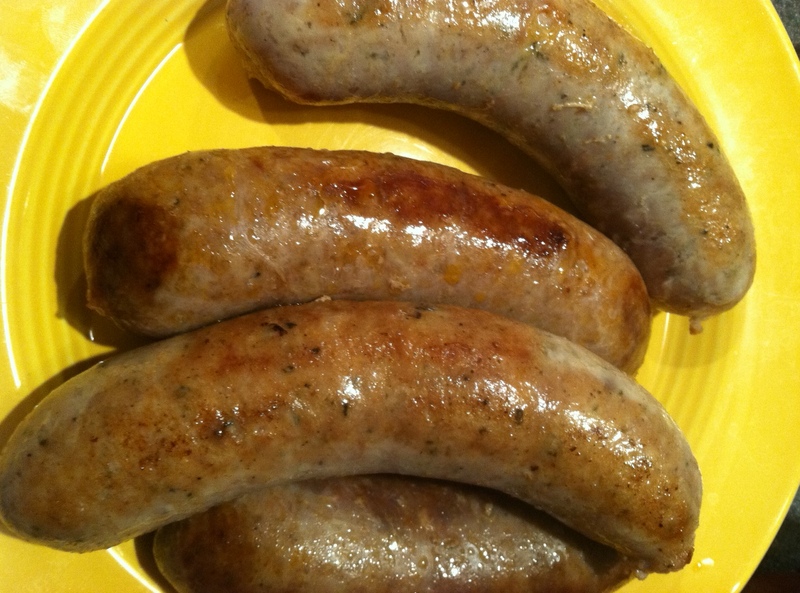 Sweet Italian sausage is ideal for this dish, but really any sausage, as long as it’s freshly packed, will be good. I tossed in a couple of chicken and rosemary links so my dish would have, in fact, the uccelletto. When your beans are close to finished boiling, brown the sausage in a Dutch oven or other heavy bottomed pan that can be used for the remaining stages of the dish, and that can accommodate all of your beans and sausage. Once browned, removed the sausage and set aside. Add a one or two tablespoons of olive oil and a few cloves of chopped garlic to your pan. Once aromatic, add several canned or preserved plum tomatoes (it is January, after all), breaking them up as they cook for several minutes. Now add in the beans, with your cup of reserved water. Tear apart six or more leaves of sage and toss into the pot, allowing the mix to come to a simmer. If the beans are still far underdone, give them some time over the heat alone, otherwise add in the sausage, and simmer for about 20 minutes, or until the ingredients have bonded, and the sauce is silky and thickened. Although it shouldn’t require any salt, adjust the flavor to your liking before serving with some lightly sauteed kale or a green salad and a spicy Italian wine. And there you have it: Fagioli all’uccelletto con salsicce. Buon appetito!